I remember when I was a kid, people back then mostly relied on TV and friends for information about tourist destinations. Nowadays, thanks to the Internet and social media, one can readily access a wealth of information about our local destinations. There are tons of awe-inspiring images of these places thanks to photographers and travel bloggers, and it's not just about Mount Mayon, Chocolate Hills, Banawe Rice Terraces or other "household names" anymore. You can go as near or as far as you want within the country and still find an amazing place. It is very encouraging that nowadays, our enthusiasm for our country's attractions is very much heartfelt. It's as if every travel photograph has a caption saying "This is paradise" and the seen/unseen photographer screaming "Ang ganda rito!!!" Pinoy pride indeed. Local tourism is certainly a cause I can get behind. 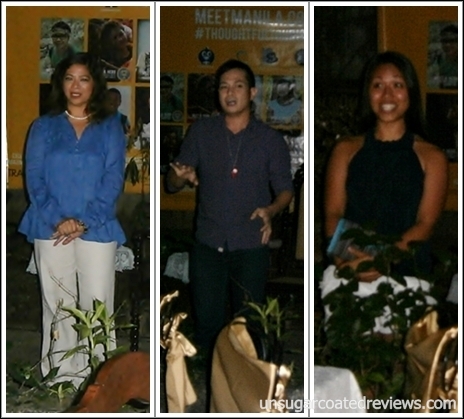 So when I was invited to the launch party of Meet Manila, I was happy. Meet Manila is a new and comprehensive Philippine travel portal which aims to promote our provinces and top tourist destinations as well as the very catchy mindset called #ThoughtfulTourism. #ThoughtfulTourism is not just tourism for the sake of attracting tourists but also involves educating and helping people to uplift small communities, conserve and ethically use our wildlife and natural resources, and promote far-flung provinces. The event gathered together online travel groups and companies, bloggers, government officials, and other groups and individuals passionate about Philippine tourism. The party's theme was Tertulia Night - a social gathering that focuses on art and literature and that has evolved from being a regularly scheduled public event in the Spanish tradition to a celebration through poetry, song, arts, and dances. 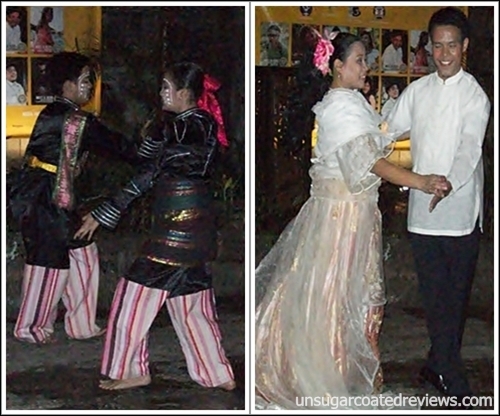 Optional but recommended attire was modern Filipiniana. The party was held in Adarna Food and Culture Restaurant in Kalayaan. Near the entrance were several forms for people interested in attending future events or in contributing articles or photos to Meet Manila. As we were filling up the forms, the nearby electric post malfunctioned and power was cut off. It reminded us of the electric post that exploded while we were at Design Perception last March and we wondered if we brought some bad luck. The people didn't seem to mind the darkness and the heat much. We might as well make the most of it, right? Bf joked that perhaps the power failure was intentional so that we could experience how it was during the time of our forefathers, back when electricity was yet to be invented. 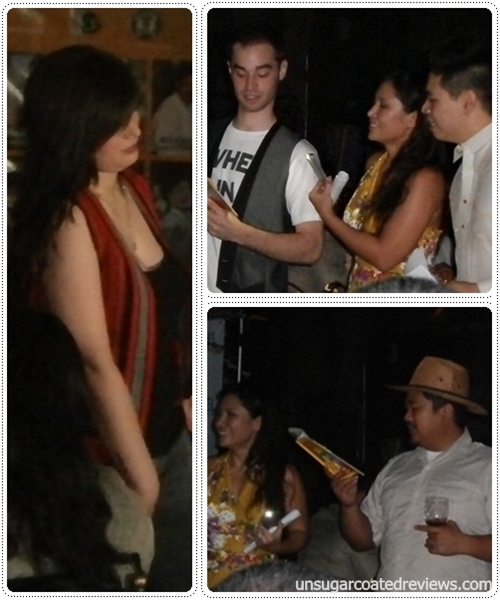 Was the party at the opening of Noli Me Tangere like this? The dinner buffet was ready so we began eating as we waited for others to arrive and for the program to begin. People could dine indoors or al fresco. The food was good (lumpiang sariwa, chicken relleno, pork adobo, bonuelos, banana roll) and the staff was polite and accommodating. I just wish the resto was better equipped for brownouts. It would have been great if Adarna had a generator that could be started within minutes or if the staff had brought out more candles or emergency lights. As it was, the available light was barely enough to see anything inside the resto. I felt that the staff didn't exert much effort in compensating for the power failure and just left the guests to struggle in the dark on their own. 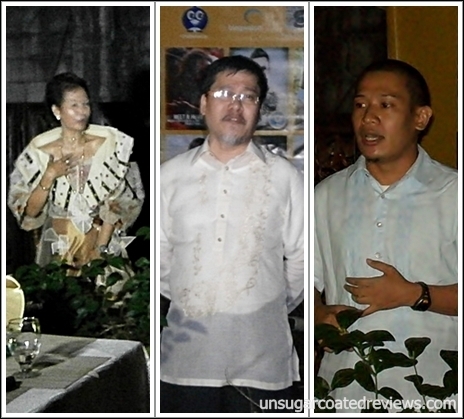 The program was held at the al fresco area of Adarna and began with bugtungan (riddles). Several guests, including beautiful actress Francine Prieto and funny guy Bogart the Explorer, took part. Several guests were also awarded, including Budgetbiyahera Mai Flores (second from the left in the picture below) who was chosen as one of the empowered travelers. Another highlight of the event was the Meet-a-Hero, Meet Manila’s list of well-deserving Filipino citizens who advocate good causes. I expected all of the heroes would talk about tourism but it turned out that they had different advocacies. Each of these heroes talked about his advocacy -- education, nature, HIV awareness, RH bill, women empowerment, preservation of ancestral houses -- and it was a delight to hear passionate people of varying ages and backgrounds talk about their causes. This is trivial but I just have to say: I was wowed by fashion designer Lito Perez's jacket! I don't know much about fashion and there were lots of well-dressed people in the Tertulia Night, but when he was called on stage, I was mesmerized by his attire. The heroes gave insightful albeit short speeches. The ones which resonated with me the most were the speeches by Lynn Pinugu and Antonio Ingles. They both talked about education. Lynn talked about being a scholar and being thankful that someone invested in her potential and because of that, she wanted to pay it forward and help poor kids find people who are also willing to invest in their potential. Antonio Ingles, meanwhile, talked about choosing to stay in the Philippines to teach instead of seeking greener pastures abroad. He even delighted the audience by reciting a song by Barney the Dinosaur. Some of the heroes were not able to attend the event, though. A shame, really, as we wanted to hear from Sen. Loren Legarda about her tree planting activities and Imee Marcos about her efforts in Ilocos Norte. The event was supposed to be hosted by Carlos Celdran and he was also included in the Meet-the-Hero list. We kept missing his tours because of schedule conflicts but he really seemed like a smart, articulate guy so I was really looking forward to watching him host the party and talk about his advocacies. Unfortunately, he had a sudden barter tour that afternoon so was able to arrive late in the event. 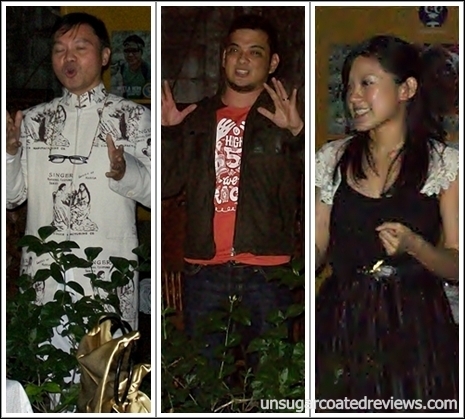 Nonetheless, Vince Golangco and his female co-hosts did a good job of leading the program. And finally, there was light. Yipee! We finally saw how beautiful the place was. As a finale, we were treated to some cultural dances. In the first number, there was an audio problem halfway through the music -- the music stopped. The dancers remained unperturbed and kept dancing. If it were me, I would have been dismayed or disheartened. Kudos to them for handling it well. After that, the music was already okay and the dancers did not encounter any other problem. congrats to Mai Flores. This is really an event that is worth attending for.With political figure around ,i'm sure everybody was waiting for them on stage. Nice review, I'm sure everybody who's been their enjoyed the show! I think my ate went there :) looks like a fun night! 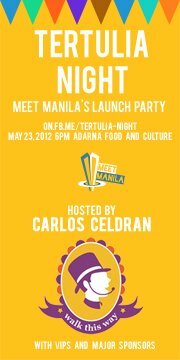 One of the best people I know who does tertulia is Ms. Cherry Gil she is so engaging and full of emotions. wow! kudos to our heroes! continue to make a difference! Thank you UnsugarcoatedReviews for this article. We in Meet Manila are very happy that we have met and gathered as one during that night. We hope to see you in our next events! Great event and original concept! Wow, the GREAT CARLOS CELDRAN! Ayos! i can imagine the pleasure and deligh of being the invited guests. Definitely visiting this one then ... I liked the interior of the place ha. kahit mawala man ang kuryente patuloy pa rin... yan ang professional. glad the program still went well... this event was really great, giving due recognition to people who deserve it most. Yahweh bless. Congrats to those who received an awards and to the organizers of the said event as well. Hope next time they will prepare generator to avoid power interruptions. Cool venue. superb. Very nice costumes too! Nice review! Wow congrats Ms Mai!! Hope to attend events like this in the future. Sad to know about the power interruption, Howcome they don't have a generator. Tsk Tsk . the place really feels like the filipino-spanish type. first time I heard of Lito FLores...he preserves heritage homes for adaptive reuse? interesting...will ask my friends on heritage conservation. Nice write-up and congratulations Mai! He's the guy behind Camp Suki (the costume rental place) and he also has fully-furnished ancestral houses that can be rented for parties in colonial Philippines style. I like the ambiance, it's so Pinoy..Plus Francine Prieto... I wish I could attend the same event in the future. I think the entire tourism industry should have more of these. It's not enough that we promote natural wonders, we should also introduce our visitors the true Filipino character. This way, they'll appreciate both our country and its people. Great point Toteng! It's also about how tourism affects other issues and how other issues affect tourism e.g. how can we encourage tourists to go here when we have all these problems like poverty. We can ignore or hide those problems but they won't really go away, so we have to address them as well. I hope that after this event, the place will consider to get their own power generator for emergencies like that. Kudos to the awardees!